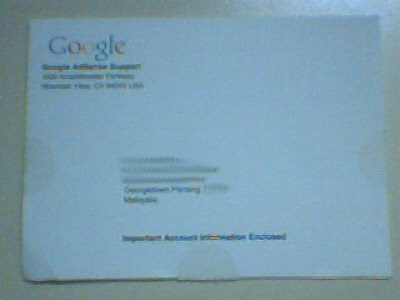 Delta's Dark Den of Destruction: Received Google PIN Postcard! Here's how the little postcard looks like. Though it doesn't have a stamp and a postmark means it could've been dropped into my postbox personally! That first payment feels good, like you've finally gotten past a milestone. Congrats! That's great. Congratulations!!! I'm glad that someone from Penang also get to earn good online income. 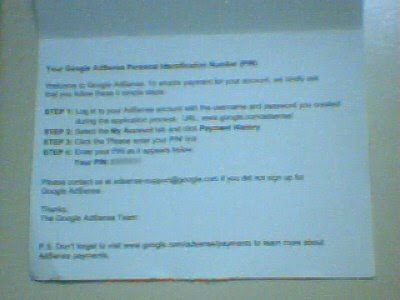 I can say that you can earn more with adsense if you really concentrate. 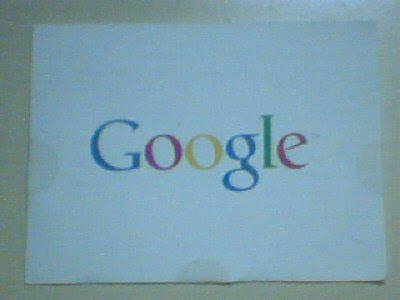 I just concentrate on two blogs with adsense placed on top of the pages, right after entrecard widget on both blogs and drop 600 entrecard each day and my adsense earnings grows from $7-8 monthly to $20-$25 each month just from these two blogs. Try to be more active in entrecard and draw more traffic to your blog. also place your adsense widget higher position where ur readers don't have to scroll. trust me, it works.